Native seeds preserved in rural Paraguay. Photo: Maria Sanz Dominguez.In Chacore, about 200 kilometers east of Asunción, Paraguay's capital, Ceferina Guerrero, 68, walks by shelves of carefully-labelled plastic bottles and metal drums. Each contains a native seed variety essential to the diets of rural communities. Their labels list seed names in Guarani, an indigenous language and Paraguay’s second official language, as well as in Spanish. Guerrero introduces them warmly, as a mother would do with her children: this one is a bean, this one is peanut, this is corn. Known as Ña Cefe in her community, Guerrero says her surname (which means 'warrior' in Spanish) fits her like a glove. She is one of the founders of the Coordination of Rural and Indigenous Women in Paraguay (Conamuri). Conamuri began as a small group in the 1990s. Today its members include women from more than 200 rural communities in Paraguay and it’s also connected to allies around the world as part of the international peasants’ movement La Via Campesina. Still, Guerrero says, “we should not forget our first objective”: collecting and preserving native seeds across the country. She describes this as a race against time – and the expansion of large-scale, industrial agriculture. Globally, 60-80% of food in most developing countries, and half of the world’s food supply, is planted by women, according the UN's Food and Agriculture Organisation (FAO). Meanwhile, the world lost 75% of its seed diversity over the twentieth century. Now, just nine crops comprise 66% of global agricultural production. Only three of these – wheat, rice and corn – account for almost half of the world population’s daily calories. These trends have alarmed NGOs, rural organisations and international institutions. Maintaining biodiversity, the FAO insists, is “fundamental” for food security and the ability to adapt to population growth and climate change. Biodiversity loss also has “specific impacts” on women who have “traditionally been the keepers of profound knowledge of plants, animals and ecological processes,” added the IPES international expert panel on sustainable food systems in 2016. Guerrero holds corn seeds, in Chacore, Paraguay. Photo: Maria Sanz Dominguez. In Paraguay, just 5% of the population owns 90% of the land. Most of this is used by huge agribusinesses to grow just a handful of crops (including soybeans, wheat, rice and corn) on vast plantations for export internationally. Last year, the country imported almost 24,000 tons of seeds. Most were for these export crops. Less than 1% were fruit or vegetable seeds, mostly potatoes. Others included Paraguay's national fruit: mburucuya (passion fruit). Meanwhile, 28 genetically-modified crop varieties (mostly soy, corn and cotton varieties) have been approved by the government since 2001, when Monsanto started to produce its soy variety resistant to the Roundup pesticide here. 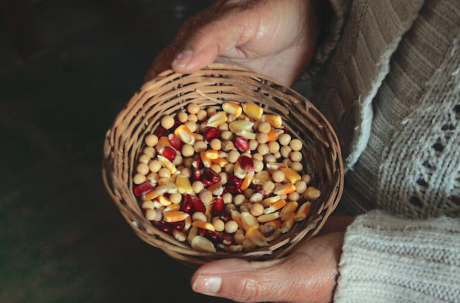 Amid corporate pressure on farming and food production, women who preserve native varieties, like Guerrero in Chacore, are “rare, like needles in a haystack,” said Inés Franceschelli, a researcher for the NGO Heñoi ('to germinate'). Following an intense campaign of mega-mergers since 2016, a small group of just three giant corporations (Bayer-Monsanto, DowDuPont, and Chemchina-Syngenta) now control more than half of the world’s seed market. These seed and agrochemical giants are also active in Paraguay, where they have been allowed to plant transgenic corn, cotton and soy. Guerrero told me that native seeds grow without insecticides, while some transgenic seeds may “produce a nice plant, with nice fruits, but if you collect the seed and plant it again, it would not germinate. You cannot reuse their seeds, and you will have to buy them again and again." What she described sounds like the effect of a controversial genetic modification that produces sterile seeds once the plant has given its fruits. Sometimes called “Terminator seeds,” some NGOs and rural organisations warn that the use of Genetic Use Restriction Technologies (GURT) can displace native varieties and threaten local food security. Paraguay is also a signatory of the UN Convention on Biological Diversity, which in 2000 recommended a de-facto moratorium on field-testing and sales of these 'terminator' seeds. The world’s biggest seed companies are all believed to have patents for such technologies, though they deny dealing in them. Ceferina Guerrero, in Chacore, Paraguay. Photo: Maria Sanz Dominguez. Currently, Paraguay is also being pressured to adopt the controversial ‘UPOV 91’ seed convention as part of a free trade agreement being negotiated between the European Union and South American commercial bloc Mercosur. Rural organisations fear that this could enable legal prosecutions against country-people for sharing or exchanging their native seeds, as they will not be able to meet the requirements for seed registration under this convention. Over the last decade, Conamuri developed its own proposals for laws to protect native and creole seeds (which are not native but have adapted to local conditions over centuries). These were rejected in 2012, after the impeachment of president Fernando Lugo (seen as likely to accept them). 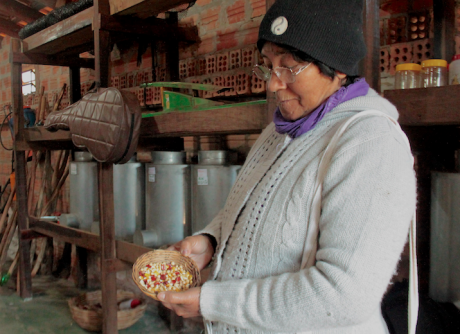 Across Paraguay, amid the spread of industrial farming, transgenic crops and seed patents, rural women like Guerrero are on the frontlines of the fight to save native varieties before it’s too late. They are producing 'green fertilisers' that help farmland to recover for the next season, and teaching others about agro-ecological farming that takes natural ecosystems into account and encourages planting a diversity of crops. They are carefully labelling containers storing the same varieties of corn their grandmothers used to cook, long ago. They are also rediscovering and preserving native seeds that haven’t been used for many years. Native seeds collected and classified by Conamuri members. Photo: Maria Sanz Dominguez.In Chacore, Semilla Róga (“the house of the seeds”) is a Conamuri project that hosts country-people from across Paraguay each month to exchange and learn to preserve native and creole seed varieties. Here, Guerrero teaches techniques on how to grow food without pesticides or insecticides. 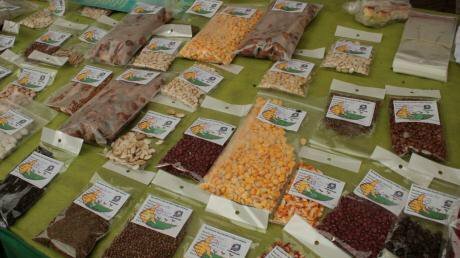 She also has her own seed store at home, preserving more than 60 seed varieties and sharing them with her neighbours. The Semilla Róga project also aims to preserve the knowledge and traditions of communities that use native seeds. “Each corn variety is suitable for a different kind of food, and belongs to a different group of people,” Álvarez explained. “For instance, indigenous people such as the avá and mbya guaraní have coloured corn for ritual use, so the plant also has cultural value,” she said. 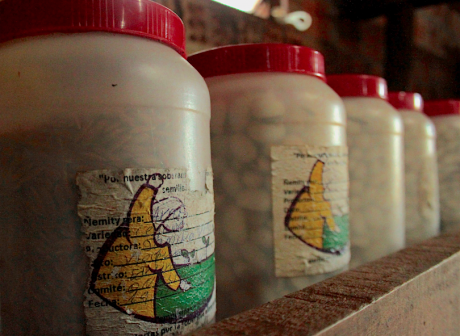 Natural medicines derived from raw seeds are also popular in Paraguay, where they are often used as cheaper alternatives to conventional drugs. (Coriander seed, for instance, is used to raise natural defenses after illnesses). “If we lose kuratu [coriander], if we lose andai [a local variety of pumpkin], we are losing medicine, and we are also losing our food, a part of our traditions as country-people, and a part of our culture and our identity,” Guerrero told me. Holding a big ear of native red corn, Guerrero explains that it should be harvested during the full moon, when the atmosphere is less humid. She shows me how to collect the little seeds on both ends for food; those in the middle will be stored for planting in the next season. * This article is part of a series on women's rights and economic justice from 50.50 and the Association for Women's Rights in Development (AWID), featuring stories on the impacts of extractive industries and corporate power, and the importance of tax justice for the rights of women, trans and gender non-conforming people.